In an another tragic incident, a Honda Civic driving on underpass near Indira Gandhi International Airport caught fire. 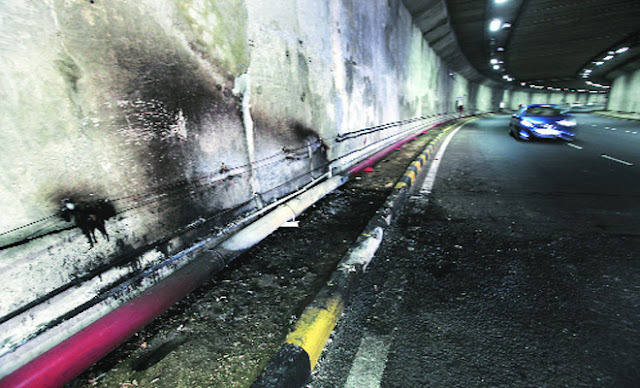 Even more pathetic news is eight fire fighting devices installed on the underpass failed to work. As per the reported by Indian express, none of those equipments were working. The incident took place on Sunday evening, 05:45 pm when a Honda Civic was travelling on underpass at Airport and the engine bay of car caught fire. The security system of the car got jam due to fire, and the man got stuck inside the car. Rajesh Kumar Misra, 32 year old man died because of 100% fire injuries. The car kept on burning for 20 minutes. The guard on duty saw the car and tried to help him but all in vain- none of the eight fire fighting systems were working, no water pressure from the pipes used to douse the fire. An eyewitness said, "The engine of that car caught fire and it went up in flames in no time. We could hear the occupant shouting for help. He was trapped inside as the doors jammed due to the central locking system. My brother and I tried to pull out the pipe from the device installed in the underpass to put out the fire, but we did not know how to operate it. The guard who was posted also came running and opened the lever, but there was no water pressure. None of the devices were working." The underpass has three water pumps, which supply water to 16 fire fighting devices — eight on each carriageway. But none is operational. The fire hydrants lack a notice informing about directions on how to use the fire fighting device. This makes it difficult for a layman to use the equipment in an emergency situation. We have earlier seen lot of such incidences where in the seecurity system and thus doors of cars gets jammed and could not be opened then. Thereby, Nissan claims they have installed a special system on their cars - Micra and Sunny in which, the driver's door never gets locked from inside and could always be opened even if locked or even if jammed. Check out the demo at your nearest Nissan dealer. Earlier, we have spotted various such incidents including Tata Nano fire, VW Vento, Maruti Alto, Esteem, and even Audi R8. In India the authorities just dont care about the safety. Just fill their stomach with more n more $$$. This is just shameful and pathetic. We agree with you Ahmed. Facilities are just for showcasing at such a world class Airport facility. It's a shame !